Stephen F. Austin State University students and professors in the Department of Kinesiology and Health Science run tests in the Human Performance Lab to better understand concepts they learn in class. The Human Performance Lab has several pieces of equipment, including a hydrostatic tank, treadmills with programmable controls, metabolic carts, an electrocardiogram and body composition analysis tools. NACOGDOCHES, Texas - Faculty and staff members in Stephen F. Austin State University's Department of Kinesiology and Health Science have taken the concept of student-directed learning and applied skills to heart. Through the use of various state-of-the-art labs, hundreds of SFA students have the opportunity to conduct research by using high-tech equipment, practice concepts learned in class in a lab setting and train with equipment they will use in their future professions. "In this department, we believe that without doing, learning is a bit remiss. 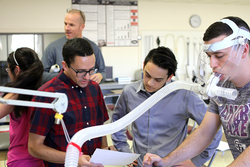 Being able to put students in a lab and have them use equipment, run tests, analyze data and more is vital to the learning experience," said Dr. Eric Jones, professor in the Department of Kinesiology and Health Science. Students studying kinesiology, health science, or fitness and human performance have access to various labs, including the Human Performance Lab, Movement Analysis Lab and Exercise Biochemistry Lab. When building the labs about 10 years ago, Jones asked, "What can we offer students that they can't get anywhere else?" With this question in mind, Jones began to acquire equipment and funds to establish labs to enhance learning and research opportunities. "We wanted to 'create' a student that no one else was creating. We wanted our students to have a marketable skill set," Jones said. "Larger institutions sometimes don't come with the applied skill set, and our applied-skills approach teaches students how to do a job." Whether they want to teach physical education in public schools, be a personal trainer or fitness instructor, or work in a clinical setting as an exercise physiologist or in cardiac rehabilitation centers, students have various opportunities to work with the same equipment at SFA that they will one day use in their careers. The Human Performance Lab, tucked inside the Education Annex, offers equipment designed to measure innovative physiological and psychological determinants, responses and performance across numerous interests. The equipment includes a hydrostatic tank to measure body fat through underwater weighing, treadmills with programmable controls, metabolic carts, body composition analysis tools, an electrocardiogram and more. Students also can gain experience working with a dual-energy X-ray absorptiometry machine, which measures body composition such as body fat and bone density. A room inside the lab is dedicated to thermoregulation and environmental physiology research. This room allows users to control the temperature and monitor the effect environmental changes such as heat and humidity have on one's body. "Our labs facilitate hands-on learning and practical application. Students are able to turn their book knowledge into something they can disseminate and apply in the real world," Jones said. A unique addition to the program is the Exercise Biochemistry Lab, which Dr. James Rowe, assistant professor, established. Dr. Dustin Joubert, assistant professor at SFA, said this type of lab is rare for a university of SFA's size. In this lab, students can draw and analyze blood for intervention research, which can include looking at metabolites in the blood and measuring the blood for glucose, triglycerides and insulin levels. The Movement Analysis Lab offers students a place to analyze movement on a computer by using the Dartfish biomechanics analysis system. Additionally, there is a small weight room for strength training and research or exercise testing purposes. The room is equipped with a bench press, squat rack and basic exercise equipment. "Having access to this equipment prepares students and gives them a well-defined master skill set that makes them employable," Jones said. For more information about the labs and SFA's Department of Kinesiology and Health Science, visit sfasu.edu/kinesiology/.